Patrick Rooney is associate dean for academic affairs and research at Indiana University Lilly Family School of Philanthropy and professor of economics and philanthropic studies (2012–present). 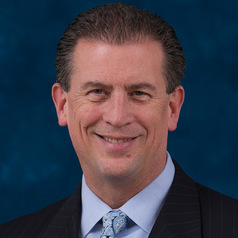 A nationally recognized expert on philanthropy and charitable giving, Dr. Rooney speaks frequently across the country on issues related to philanthropy and management of nonprofit organizations and has been quoted by national news media outlets such as PBS’s Nightly Business Report, The New York Times, The Wall Street Journal, The Washington Post, and USA Today. He has served as a member of several national advisory groups, including advisory committees for the U.S. Corporation for National and Community Service, the U.S. Bureau of the Census’ Current Population Survey, the Association of Fundraising Professionals, INDEPENDENT SECTOR, outgoing chair of the Board for the Nonprofit Academic Centers Council, Better Business Bureau Wise Giving Alliance, and the Commission on Accountability and Policy for Religions Panel on Nonprofit Sector Representatives. Prior to joining the Center on Philanthropy, Dr. Rooney served as both special assistant to the Indiana University vice president for long-range planning and chancellor of Indiana University–Purdue University Indianapolis (IUPUI) and as assistant dean for academic programs for Indiana University–Purdue University Columbus (Indiana). He has served as a board or committee member for several nonprofit organizations, including the Techpoint Foundation, the Rollins College Philanthropy & Nonprofit Leadership Center, United Way of Central Indiana Strategic Planning Committee, and the Children’s Bureau of Indianapolis. Dr. Rooney previously served as the Center on Philanthropy’s chief operating officer and as the director of research from 1999 to 2008. He created the center’s formal in-house research program, building it into one of the premier philanthropy research organizations in the nation. He directed center-wide research activities, including overseeing the center’s signature research project, the Center on Philanthropy Panel Study (COPPS). Conducted in collaboration with the University of Michigan’s Panel Study of Income Dynamics, COPPS is the largest and most accurate study of charitable giving over time ever conducted. Dr. Rooney also led the Center’s ongoing research projects, including the research and writing for Giving USA, which is produced by Giving USA Foundation. He coordinated the Center’s extensive contract research program and has guided research for clients such as Bank of America, American Express, Target Corporation, United Way of America, the Business Civic Leadership Center, and the U.S. Chamber of Commerce. In 2008 Dr. Rooney and the Center’s research team received the John Grenzebach Research Award for Outstanding Published Scholarship from the Council for Advancement and Support of Education (CASE). Patrick then served as executive director at the Center of Philanthropy from 2008 to 2012. A professor of economics and philanthropic studies at IUPUI and a member of the graduate school faculty at Indiana University, Dr. Rooney is a prolific researcher with an extensive body of published research. He earned his B.A., M.A., and Ph.D. in economics at the University of Notre Dame and a Certificate of Management Development at Harvard University. He also earned a Certificate in Fund Raising Management from The Fund Raising School at Indiana University Lilly Family School of Philanthropy.